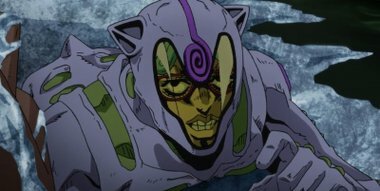 Ghiaccio's Stand, White Album is able to envelop him like a bodysuit and able to freeze everything around him to extremely low temperatures. Giorno and Mista somewhat make it to Venice, despite being partially frozen by Ghiaccio. But in order to try to get away from Ghiaccio, Giorno drives their car into the canal and they get stuck. Mista tries to sacrifice himself, but Giorno tells him that what's important right now isn't for him to sacrifice himself but for him to have resolve.